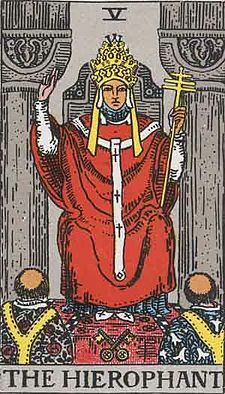 Liberal Bohemian: 5th day of the year; the Hierophant card. 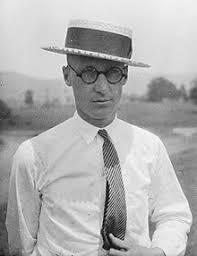 In 1925 a trial took place on this day in Tennessee, which became known as the Scopes Trial. It involved a teacher called John T. Scopes, who had the state of Tennessee take him to court for violating a new law -- the Butler Act -- that forbade him from teaching human evolution, in favor of the belief in the diving creation of humanity, as entertained by the Christian Bible. Get this, John T. Scopes lost the lawsuit and the state of Tennessee continued to teach the myth until 1967 when some of those damned Yankee liberals moved in and had it changed. Funny, in 1981, the state of Arkansas voted for the same law called the 'Balanced Treatment for Creation-Science and Evolution-Science Act.' Personally, the only problem I have with these "myth" laws, is that they never use the Ancient Alien myth that I believe in, but I digress. 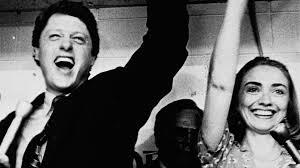 On a lighter note, it was that 1981 backwoods, e i e i o vote, that made it possible for Bill Clinton to become governor in the next election, when the people of Arkansas (mostly parents with kids in school who couldn't believe their children were being lied at by their teachers) to vote for change: a Republican Light Governor who would go on to fool the masses he wasn't a Republican. I guess history really does repeat itself. With all this 'fake news' that will eventually lead to Donald Trump's impeachment, a similar thing happened on this day in 1895: Alfred Dreyfus, an artillery captain of Jewish descent attached to the French General Staff, was convicted of treason by the French government and was forced to undergo an excruciating ritual of degradation before being shipped off to serve a life sentence on the fearsome penal colony Devil's Island. At 9 a.m., Dreyfus was marched into the center of the Ecole Militaire courtyard, where, before representatives of all France's armed forces and stands full of distinguished guests, his self-described "horrible torture" began. "I suffered agonizingly, but held myself erect with all my strength," he recalled. 'To sustain me I called up the memory of my wife and children." The sentence of degradation was read aloud, after which Dreyfus suddenly cried out to his comrades, "Soldiers!..I am innocent, I swear that I am innocent. I remain worthy of serving in the army. Long live France! Long live the army!" Despite his protest, guards stripped Dreyfus of his buttons, braids, and epaulets until his uniform was bare of decoration. The ceremony ended with a parade -- a walk of shame. "I was compelled to make the whole round of the square," Dreyfus recounted. "I heard the howls of the deluded mob (chanting, 'Lock Him Up" no doubt), I felt the thrill which I knew must be running through those people, since they believed that before them was a convicted traitor to France; and I struggled to transmit to their hearts another thrill -- belief in my innocence." In 1898, however, Major Hubert Henry admitted that he had forged much of the evidence. 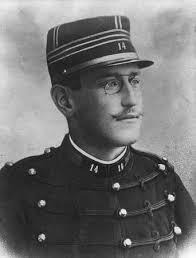 In 1906 the Dreyfus conviction was overturned. Oppppsss, this isn't actually the same as what is happening with Donald Trump, is it? Sorry for the confusion. Oh, and, in 1985 a statue of Dreyfus holding his broken sword was crafted and placed in the Ecole Militaire courtyard; in 2002 the words "Dirty Jew" were painted on it. 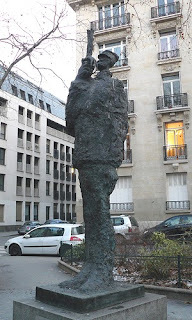 it now stands on an obscure Parisian traffic island. In England, Twelve Night and Wassail Eve herald the end of Christmas. In some parts of Italy, the crone goddess Befana is said to distribute sweets to good children and lumps of coal to bad ones. Her festival is celebrated with songs, music, horns, and noisemakers. 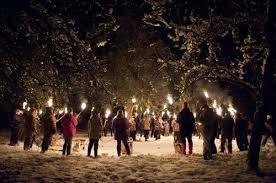 The loud sounds drive away evil and mark the passage of winter. 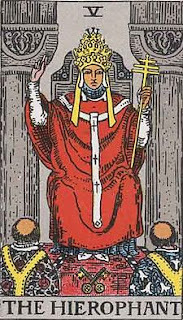 The 5th card of the Major Arcana is The Hierophant, an interpreter of sacred mysteries who is symbolic of human understanding and faith. His knowledge is esoteric and he has authority over things unseen. Favorable traits conferred by this card are self-absurdness and insight; unfavorable traits include moralizing, bombast and dogmatism. Thus, January 5 people must be careful of being too pompous in their attitudes.